Hi Laika, that is a fantastic job! I like the sound from the OPA opamps and the price is reasonable. Would it be ok if I add the photos to the Photo Gallery on the site? Thanks ... Yeah feel free add the pic's to the gallery, I know I like checking out other peoples projects. I just added it to the gallery. What did you think about the sound and what cans are you using with it? Great job, very neat build. Which gain did you go with? 11 according to info on the headwise site were I worked from. 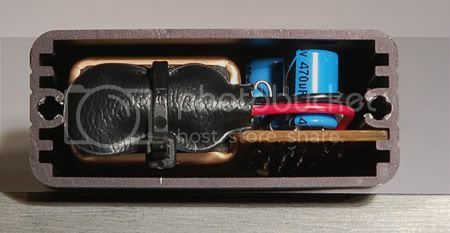 Since I start work on this amp I found a local source of the 2134 op-amps and these smaller pots that would make the panel less cramped. Also, depending on what you are using as a source, you may want to try a lower gain. Hi Laika, I have a pair of Grado SR80 headphones. I liked the midrange over that of the SR60, but the SR60 had better low end. Interesting .. I thought the 80's were said to have better bottom end than the 60's (just from reading comments on the web)... maybe Its a good thing I haven't ordered my new headphones just yet.... I might look at getting the 60's instead. Yeah I had some time over the weekend to try all my various sources and the gain was a bit much so I added sockets for the gain resistors and tried a few different values. For now I've changed the gain to ~ 6x instead of 11x and this seems more useful... I will have to see how this works out when I get my new cans. Hi Laika, I found that the SR60 are not as smooth as the other models in the midrange and the highend. I'm not sure how the new SR60i and SR80i are different. If you don't need the gain, my preference was to use lower and I settled on about 4 to 6. 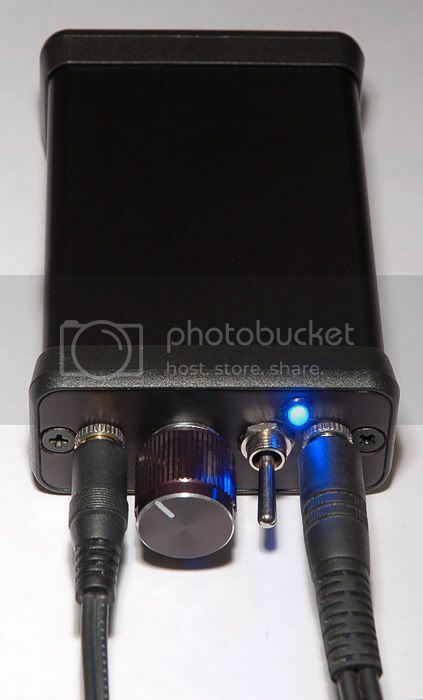 Nice headphone amplifier, I like how compact it is. 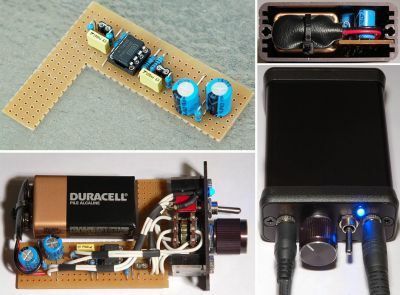 I made one of about the same size, but does not work as well as yours and has no volume control, and not enough gain to be used for an MP3 player, which really defeats the point of it so at some point I will need to rework the circuit. 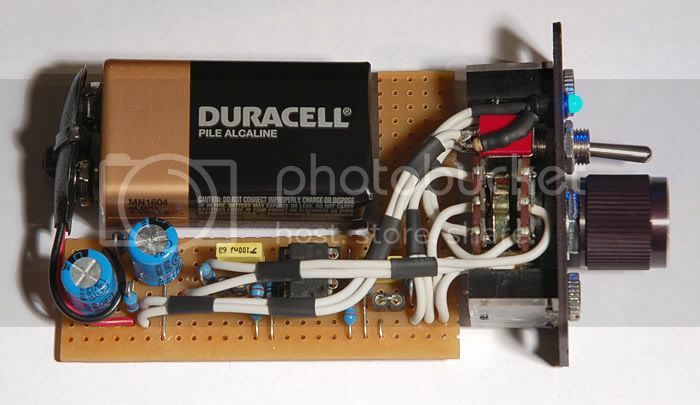 But it is the simplest amplifier on earth... only one little NPN transistor and a couple of resistors and capacitors. 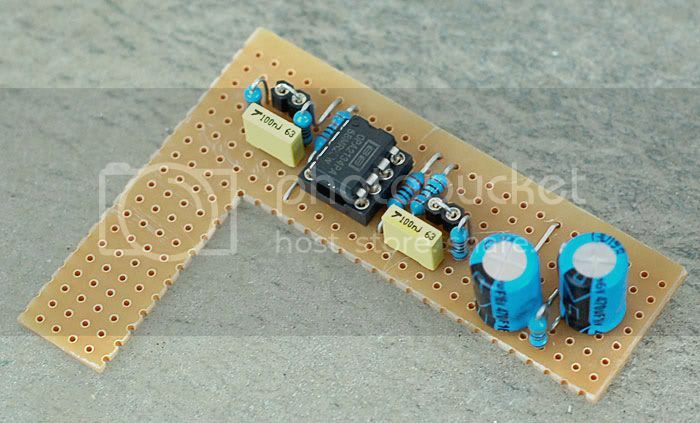 Just felt you may be interested in seeing it and maybe try the design for your self, all you need is a 2N3904, and it is so simple I don't even have a schematic for it.